Hello again OLB friends! 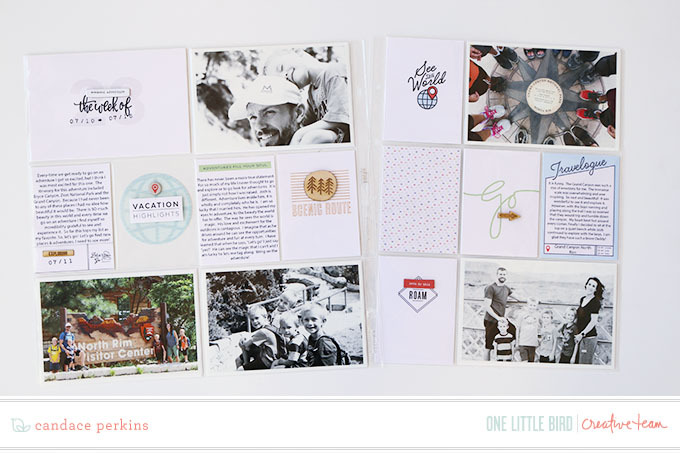 Candace here to share another project life spread using some fun digital cards from the shop. 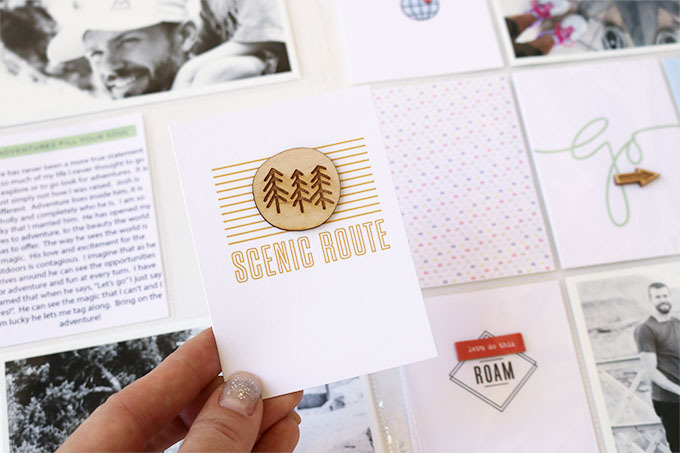 The Roam collection is one of my absolute favorite collections! As a family of all boys we go on lots of wild and crazy adventures. Recently we went to the Grand Canyon and did a hike all together. 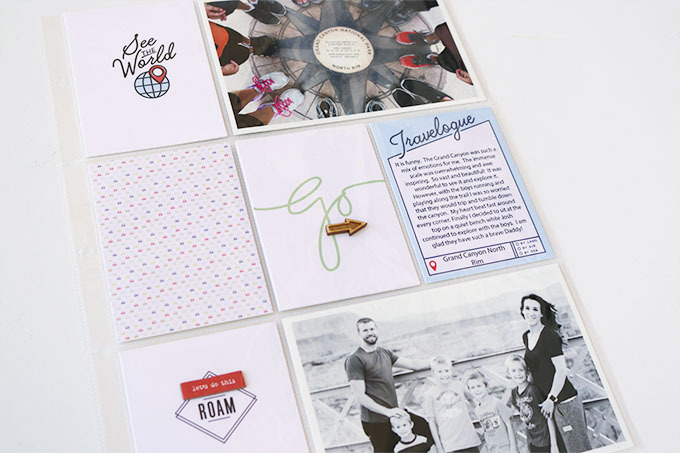 The vacation was perfection and I was so excited to get home and put the Roam collection to work. Here is a look at the full spread using the Roam kit. We had lots of pictures from our trip so the documentation goes on for a few more pages. I wanted to make sure that I had journaling for all the pages so I needed lots of filler cards to fill the extra card slots. I used inspiration from the kit to fill all the spaces and create a clean, balanced layout. 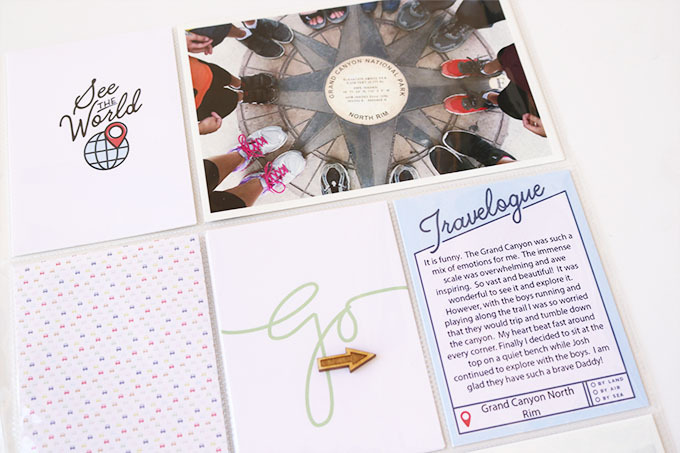 I used the “See the World” and “Go” card as inspiration for the base colors for the layout. 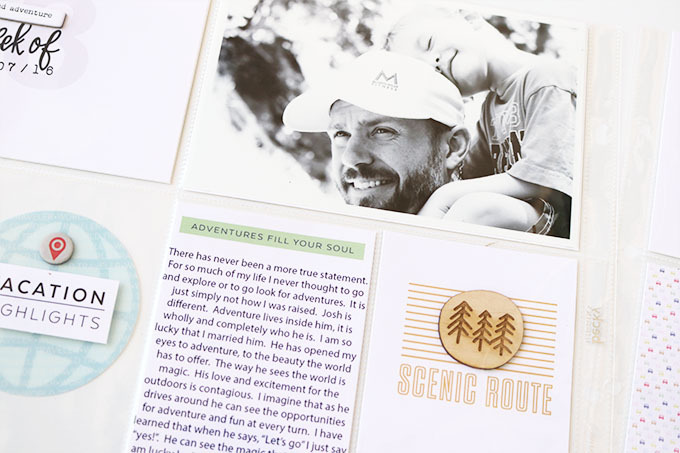 After printing out all the journaling cards I looked thru the papers and embellishments to find elements that would bring balance to the spread. I created a journaling card on the left side of the spread by adding a green sentiment to the top of a card. The repeats the green on both sides of the spread but still keeps the spread nice and clean with lots of white space. To balance the blue on the spread and create a visual triangle I used the “Travelogue” tag from the elements and turned it into a journaling card that I could add my thoughts and feelings to. I loved this little journaling card as it was printed but I needed to add another wood veneer embellishment to balance the left and right side of the spread. 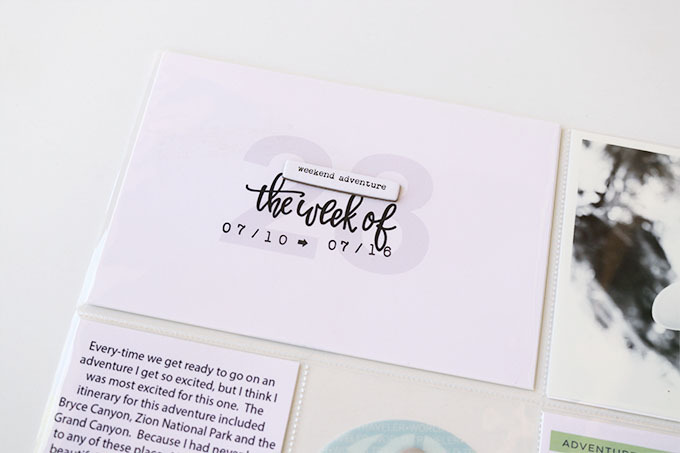 I found this little circle tree embellishment that was a perfect fit inside the lines of the card. It even matched the theme and feel of the layout! I was SO excited when I found this coordinating blue globe in my stash! 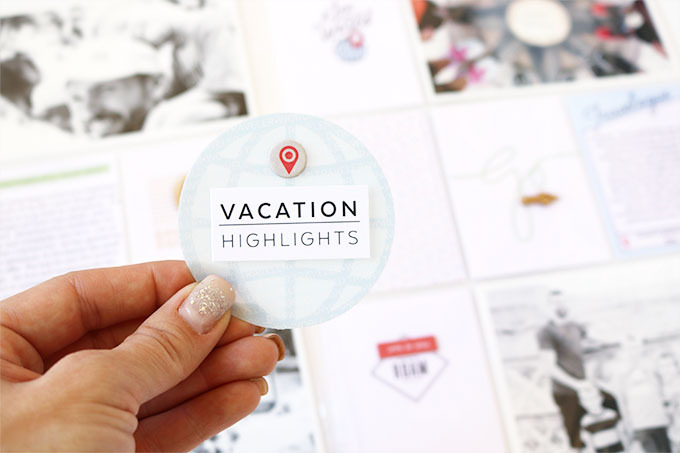 I added a little sentiment from the elements kit and a red geo tag. A perfect addition to the spread. Thanks so much for stopping by today! 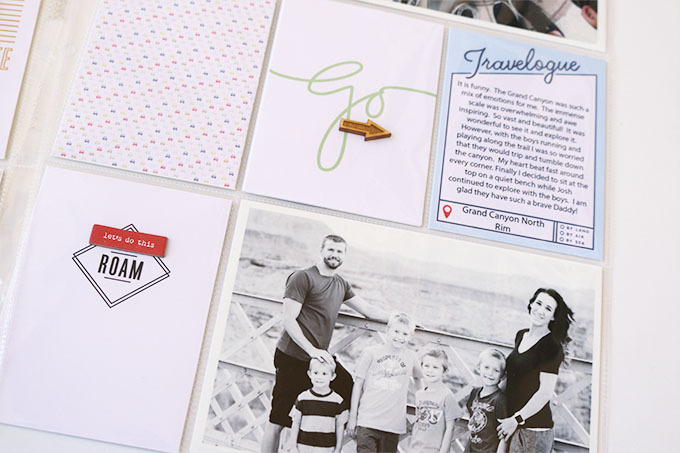 Give this a try on your next layout, find one card in a collection and build your spread around it. You will be surprised at how fast and balanced your layout comes together. Have a beautiful day! 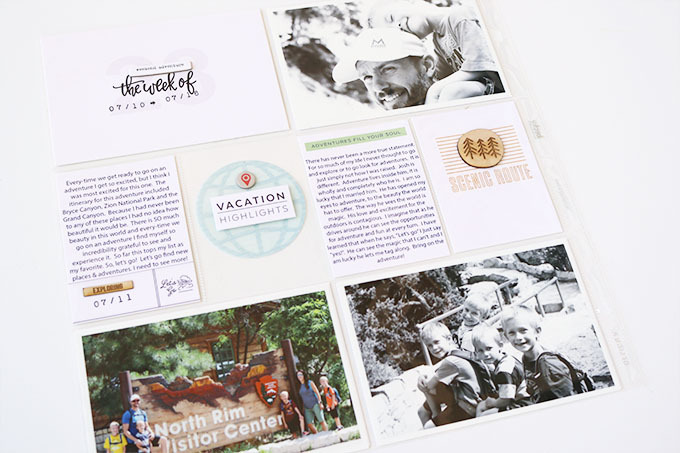 Products Used: Roam Journaling Cards, Roam Elements, Roam Papers.